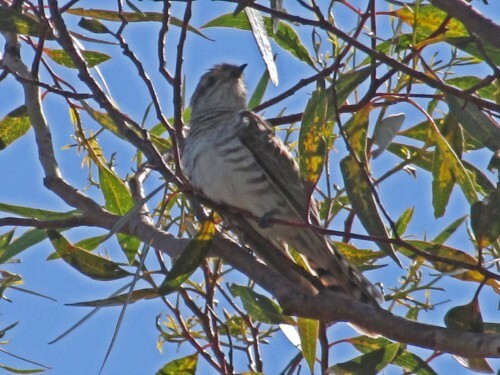 Over recent weeks we have heard one or two Horsfield’s Bronze-cuckoos calling from various vantage points on our property or nearby; their call usually carries well over a hundred metres. On one occasion I saw two in the tree shown in the photos here. One was chasing the other so I suspect that mating was imminent. The tree in question is about 40 metres from our back varanda. Most of the various cuckoos in Australia are like the true cuckoos of Europe except for their call. They are parasitic breeders, laying their eggs in the nests of a wide range of host parents who then incubate the eggs, hatch and raise the young. In many cases the cuckoo will dispose of the host bird’s eggs, or the cuckoo chick will hatch first and remove the eggs or young as the hatch. We also get the Pallid Cuckoo and the Fan-tailed Cuckoo in our area most spring times but I haven’t heard either of them yet this year. On only one occasion we had a Shining Bronze-cuckoo in our garden, and it is possible to have the Black-eared Cuckoo here too, but I’ve yet to record that species on our block of land. While having lunch on the banks of the Murrumbidgee River in Balranald last June, I saw a Fan-tailed Cuckoo quietly feeding in a nearby group of trees. I crept as close as I dared, trying not to scare it away. Eventually I was able to get this somewhat fuzzy photo – it’s not brilliant, but it’s the best of a bad lot. That’s what happens when one pushes one’s camera to it’s limit. The Fan-tailed Cuckoo is a species I haven’t seen all that many times, so any any sighting is a good one. One day I shall also get a good photo. I went for a half hour walk this morning. There was just the right amount of briskness in the air, no wind, no frost and a few foggy early morning clouds off in the distance. I set off just as the sun was peeking over the horizon. I felt good. The most interesting species was a Horsfield’s Bronze-cuckoo calling. It is usually about this time of the year, as spring approaches, that the various cuckoos head towards southern Australia for the breeding season. There are also signs of much activity in our garden and surrounding areas indicating that many species are preparing for nesting, or have already started. Just the right conditions for the cuckoos to come in secretly and parasitize the nests of other species. I was out in our garden yesterday when I saw one of our resident Willie Wagtails chasing a bird I didn’t recognise at first. When it eventually sat still enough and I could get a reasonable look at it, I realised that it was a Horsfield’s Bronze-cuckoo. Nothing unusual about that. We often hear them calling in the spring time and sometimes during the summer too. Sometimes they stay around for a few days and at other times they are just passing through. What is unusual about this sighting is the timing. Most of this species has already flown north for the winter by the end of March, or even earlier. This individual was either a little tardy in its migration, or it was lulled into staying by our warm start to autumn. On the other hand, some individuals of many of our cuckoo species here in Australia are known to occasionally “over winter”. This means that they don’t migrate to northern Australia but prefer to stay and enjoy our brisk winter. Probably saves quite an effort in flying all that way, too. Sadly, I don’t have a photo of this species yet, and it had flown off before I could fetch the camera from in the house. Despite that, it was a nice sighting at this time of the year.